About Eric: Eric has been a competitive cyclist since 1988. Eric’s hobbies are hiking, winter camping, skiing, snow shoeing, reading, and tinkering with electronics. Accomplishments are he climbed Mt. Kilimagario and skied the American Birkebeiner. 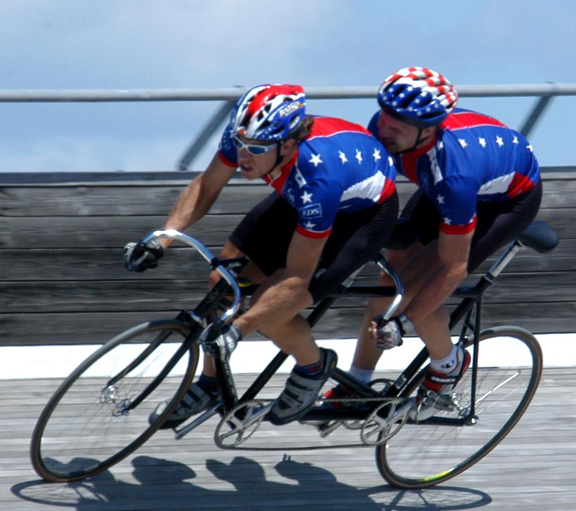 2004: U.S. Paralympic Track Cycling Championships, Frisco, Tex., placed first in the tandem match sprints, second in the kilometer, and third in the pursuit. DeGolier and King will represent the United States 2004 Paralympic Cycling Team which will be competing in Athens, Greece.